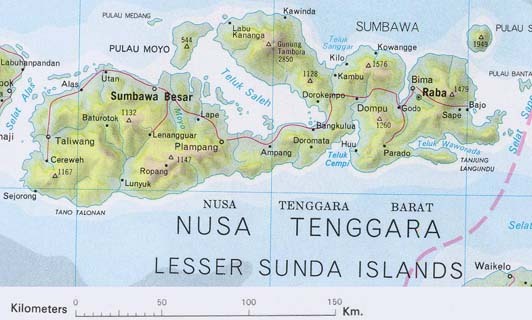 On August 19, 1977 a great earthquake occurred just south of the Lesser Sunda Islands (NusaTenggara region), west of Sumba Island in Indonesia. This was the largest earthquake along the Java Trench in several decades. 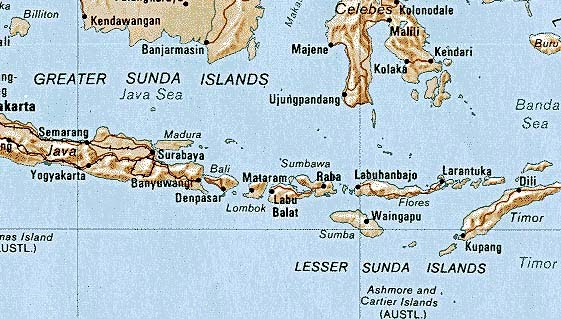 The Lesser Sundas include Bali, Lombok, Sumbawa, Sumba, Flores, Timor, Alor, and the adjacent smaller islands. A major tsunami was generated which was particularly damaging along the coasts of Sumba, Sumbawa, Lombok and Bali. The earthquake's occurred at 06:08:52.2 UTC. The Pacific Tsunami Warning Center's preliminary epicenter location was given as 10.5 S, 118.8 W., about 170 kilometers SSW of Pradapare, Sumba Island (West Nusa Tenggara). The initial Richter magnitude was estimated at 7.7. The epicenter was subsequently revised to 11.09S, 118.46E. and the earthquake's Moment Magnitude was recalculated (Mw- 8.2, Ms - 8.1, ML - 8.9) recently. The quake's maximum intensity was estimated to be VIII in the immediate area, and Mo - 24*10*20 Nm. The quake was very widely felt and forcing people in Perth, Australia, more than 2000 Km southward, to flee from office buildings. The earthquake caused damage to office and school buildings, a mosque and a market in Sumbawa and Bima. The quake and the tsunami caused 107 deaths in the entire Nusa Tenggara region. 54 more people were reported missing and presumed dead. A total of 440 houses were destroyed or heavily damaged, 467 boats were missing or damaged and 5 school buildings collapsed. The Indonesian region is one of the most seismically active zones on earth. It is an island-arc structure of about 17,000 islands spread out along a belt of intense volcanic and seismic activity. The major tectonic features, which characterize the region, include a deep oceanic trench - the great Sunda/Java Trench - on the Indian Ocean side, a geanticline belt, an extensive volcanic inner arc, and several marginal basins. The volcanic arc has about 400 volcanoes with more than 100 being active. The best known of the volcanoes is Krakatau in the Sunda Strait, between the islands of Java and Sumatra. The 1883 explosion and collapse of this volcano generated an enormous tsunami that killed close to 37,00 people. Subduction of the India and Australian plates beneath the Sunda and Java sub plates of the Eurasian tectonic block occurs along the entire length of the great Sunda/Java Trench. The effects of plate movements are not confined to the boundary region but extend to the subducted plate itself, resulting in extensive faulting, uplift or subsidence, offshore and on the islands. For example, oblique convergence and subduction along the tectonic boundary in the offshore area of western Sumatra has produced the great Semangko strike-slip lateral fault on that island. 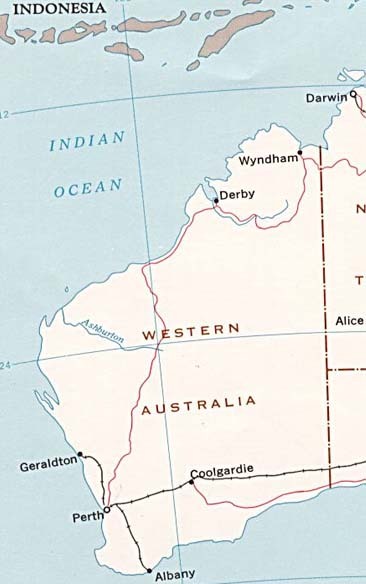 Similar oblique subduction occurs along southern Java and the Lesser Sunda Islands as the Australia plate slides in a north-northeastward direction beneath the Sunda plate, at about 60 mm/yr. The rate of subduction along the Sumba and Sumbawa segment of the East Java Trench is estimated to be about 50 mm/yr. Near New Guinea the subduction rate increases to as much as 107 mm/yr. Regional significant, major and great Earthquakes from 1900- 2003 in Southeast Asia, Indonesia and the Philippines. The earthquake of August 19, 1977 in the vicinity of the Lesser Sunda Islands generated a major destructive tsunami. Waves of up to 30 meters height were reported on adjacent Indonesian coasts, and as much as 8 meters in Australia. With support from UNESCO- Intergovernmental Oceanographic Commission (IOC) and from the U.S. National Oceanic and Atmospheric Administration (NOAA), and with permission of Indonesian authorities the ITIC team - joined with Indonesian investigators headed by Dr. Susanto, Institute of Meteorology and Geophysics of the Department of Communications - conducted a survey of coastal areas on the islands of Sumba, Sumbawa, Lombok and Bali. The team surveyed tsunami damage and run up and got first hand accounts from local residents. In addition, air reconnaissance and photography was made along inaccessible portions of the south coast of Sumba and Sumbawa Islands. Agencies of the Indonesian Army, Search and Rescue, the Disaster Relief Coordination Team, the Provincial Government and Medical Teams had already visited accessible coastal communities to bring aid, and to assess damage and casualties. These records were supplemented by radio reports from isolated communities. A search and rescue team of 19, including a surgeon and 2 nurses, had parachuted into Lunyuk, where more than 100 casualties had occurred. The Ministers of Communications and of Economic Affairs visited severely damage areas to develop Government relief and recovery programs. Coastal roads do not exist along the shores of the Lesser Sumba Islands fronting the Java Trench, but with the exception of Sumbawa some communities can be reached by road from the interior (generally though the south coasts are rugged, except for Bali, and villages are small and scattered). In consequence no major ports were in the seriously struck areas and casualties thus were relatively low. Incomplete reports indicated that more than 180 people were killed and 3,900 were left homeless. Personal losses include homes, fishing boats, and gear. No tide records of the tsunami were available for most areas in Indonesia. However, the accounts given of the tsunami by observers at several locations have reasonable consistency. The tsunami arrived on the Indonesian coast about an hour or two after high tide and commenced with a recession that frequently left an additional 100-200 meters of beach exposed. Three large waves followed at intervals of perhaps 5 minutes or less, the first being the highest and most destructive with a maximum run-up height of 15 meters. The waves penetrated about 500 meters inland in some coastal valleys, killed almost 200 people and left 3,900 homeless. A few observers noted a continued sea disturbance afterwards, but this was not generally recognized. An unusual feature was that between the time of the quake and the tsunami arrival residents in Sumbawa and Lombok communities heard up to 3 explosive sounds, over a period estimated from a few seconds to a minute or more. These were described variously as sounding like bombs, aircraft breaking the sound barrier, or thunder. The sound in each case came more or less from the direction of the earthquake's epicenter offshore. Almost every community reported the water turning black, and some claimed also that it increased in temperature and bad a bad odor. Bali - In Kuta, Bali one person was killed and 5 houses collapsed, 26 boats were broken or missing. Lompok - On Lombok, 20 persons were killed, 115 houses damaged, 132 boats missing or broken. Sumbawa - On Sumbawa, 81 people were killed, 53 people missing, more than 1000 people lost their properties, 63 houses, one school building, one mosque collapsed and the other was cracked. However, on an inaccessible section of Sumbawa Island, a preliminary study indicates that the waves reached at least 15 meters above high tide, and penetrated about 500 meters inland in some valleys. In Kuta - Bali one person was killed and 5 houses collapsed, 26 boats were broken or missing. Following the survey of the tsunami in Indonesia, the ITIC survey was extended to Perth in Western Australia. Although the northwest coast was not visited (because of heavy flight bookings), tide records from gauging stations were obtained through the Departments of Public Works and of Meteorology, as well as first hand accounts and reports of people who witnessed the tsunami. Consulting engineering firms working with mining and offshore oil drilling firms also extended much help and cooperation in the collection of data. Reports indicate that on the Australian coast, as in Indonesia three major waves came in - with the first being the largest. The disturbance continued for a number of hours. A wave height of 2 meters was reported at Dampier, 2 to 4 meters at Port Sampson, and 6 meters at Cape Leveque. The tide was falling and, at most places, it was near low and this reduced the tsunami impact. There was apparently no loss of life in Australia, though it is reported that at least one person was swept into the sea by the waves. Destructive tsunamis in Indonesia can be generated along the entire coasts of Western Sumatra, Southern Java and Bali, the Nusa Tenggara islands (Lesser Sundas), the Banda Sea and Southeast Sulawesi, the Molluccas, North and Southeast Sulawesi, Irian Jaya and the Makassar Strait. With the exception of the tsunami generated by the 1883 explosion of the Krakatau volcano (which produced a wave of more than 100 feet in height) the highest tsunami ever recorded in Indonesia was caused by an earthquake near Flores Island on December 12, 1992. This tsunami had waves of almost 26 meters in height. There are two major seismic source areas in Indonesia that are capable of producing major and great earthquakes. These two source areas have generated destructive tsunamis in the past and can be expected to generate more in the future. The first of the source areas lies along the Sunda Arc - which extends approximately 5,600 km from the Northern Andaman Islands in the northwest to the Banda Arc in the east. The Sunda Arc consists of three primary segments: the Sumatra segment, the Sunda Strait Segment and the Java Segment. 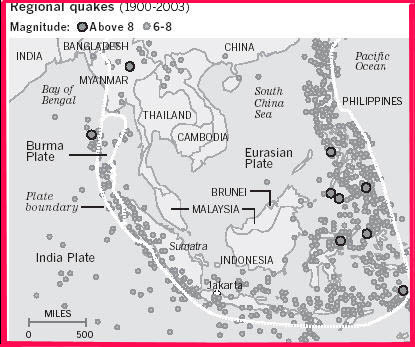 Most of the major and great earthquakes occur along the fore-arc region of Western Sumatra and Southern Java. These segments are capable of producing large, shallow tsunamigenic earthquakes with maximum Richter magnitudes of up to 8 (up to 9 or even more in Moment Magnitude if more than one segment breaks). Also, large deeper earthquakes with focal depths in excess of 70 km can occur, but these do not generate tsunamis. Tsunamis generated along Western Sumatra can be destructive throughout the Indian Ocean. Tsunamis generated along Southern Java and the Lesser Sundas can have destructive effects in Indonesia and Australia. The second source area of major earthquakes is along the shallow crustal faults that generally parallel the Sunda Arc (east-west), with some transform surface faulting that marks north-south trending boundaries of landmasses. Earthquakes with maximum magnitudes of 7.0 and focal depths of less then 70 km can occur along this second source area. Peak ground accelerations of surface seismic waves can range from 0.15 g (gravitational acceleration) to as much as 0.35 g or more. These earthquakes can also generate destructive tsunamis but their destructive effect is more localized. Pararas-Carayannis, G., 1977. International Tsunami Information Center A Progress Report For 1974-1976. International Coordination Group for the Tsunami Warning System in the Pacific, Vina Del Mar, Chile, 1977. Pararas-Carayannis, G., 1977, Indonesian Earthquake and Tsunami of August 19, 1977, Intern. Tsunami Information Center Report, Abstracted article in Tsunami Newsletter, Vol. X, No. 3, September, 1977. Pararas-Carayannis, G. 1977. International Tsunami Information Center, Tsunami Report 77-12 , Tsunami Reports for 1977.